Do You Wait Until the Last Minute? I'm notorious for being a procrastinator. I wait until the last minute to get things started. I think I work better under pressure. So, if you are like me and need to throw a fabulous dessert together for that picnic you were invited to eight weeks ago, you can whip this up quickly. You could make this in a pie pan if you don't have a tart pan, but I think the filling would be too much if you made it thick. Also, we decided, my sister and I, that the jello is totally unnecessary, especially if you are using all that wonderful fresh fruit. Mix wafer crumbs and butter until well blended; press onto bottom and up side of 9-inch tart pan. Freeze while preparing filling. Beat cream cheese and sugar in large bowl with mixer until well blended. Gently stir in cool whip; spoon into crust. Top with berries. Refrigerate. Add boiling water to jello in medium bowl; stir 2 min. until completely dissolved. Add ice; stir until melted. Refrigerate 15 min. or until slightly thickened; spoon over fruit in pan. Refrigerate 3 hours or until set. Love black raspberries. My mom planted a few little sprigs a few summers ago, and now she has an abundance of berries. This past weekend when we were visiting, the berries were just beginning to turn. I picked two handfuls of ripe berries but ate them all before I shared them with the kids. Before we left today, my mom went down and picked me a large bowl to bring home. This cobbler from Southern Living is super easy and quick if you have fresh berries. When I was struggling through college, I hated those people who just took classes because they could take classes in their spare time. You know the ones, the ones who came to class right on time. The ones who had outlined the assigned reading. The ones who had a list of prepared questions to ask during discussion. The ones who kept asking questions fifteen minutes after class ended. The ones who would walk with the professors to their offices to continue the discussion. Because I was an English major, we got lots of these people. Bored housewives, retired professionals who wanted to sit around and discuss Milton. Except this one time - her name was Michelle. I was enamored with Michelle. She and her husband were from Maine. He was transferred here because of his job with some big lumber company. Since West Virginia is not the hub of industry, Michelle couldn't find a job in her degree, so she took some classes, just because. She was cool. Her family's dogs were pictured in the L.L. Bean catalogs. She took cooking classes to learn how to make meals for her husband. Her husband loved brownies but didn't like the crusts. She would show up for class with little baggies of warm brownie crusts for us. (This is probably the main reason that I loved her.) I always thought that was the picture of love for her husband - making brownies and cutting off the crusts. I made Chocolate Peanut Butter Covered Brownie Bites from Jenny at Picky Palate today. I'm taking them to my mom's. Because my husband likes any part of the brownies, I left him little bags of crust. He may not truly appreciate how I associate brownie crusts with devotion but he will still eat them all with big glasses of milk. *These were super cute, but I'm not sure they were worth the effort. The idea was simple but the dipping is too time consuming for me. From one 9 X 13 pan, I had about 45 brownie balls. Ina and I are real tight friends. Or we were. Until, limes were on sale, and I decided to make her Tequila Lime Chicken with a few substitutions. Ina states in her recipe that she uses Cuervo Gold tequila. I'm cheap and will also not use the whole bottle of tequila, so I bought the El Toro brand in the plastic bottle. I still thought the $9.00 price tag was a little high. Also, forgot to buy the fresh oranges. We always have Juicy Juice and we were lucky enough to have Orange Tangerine. Didn't want to outdo the cheap tequila, so it was a perfect pairing. I seriously doubt that Ina has ever used this ingredients in her recipe. I seriously doubt that El Toro has ever been on her pantry shelf. This was a fabulous spark to grilled chicken. Combine the tequila, lime juice, orange juice, chili powder, jalapeno pepper, garlic, salt, and pepper in a large bowl. Add the chicken breasts and refrigerate overnight. We've made it to the farmer's market a couple of times this year. Our market is small but full of nice, friendly people. Like the man who keeps trying to talk to my kids, even though they are painfully shy like their mama. He always finds a little something for Frick to pick out so that he'll have something small to carry. Because he is so nice, I always buy something from him. This week it was a bag of mixed salad greens. I'm not a lettuce connoisseur so what the heck is all of this? The kids and I have been weeding the flower bed. When I fixed a salad with this mix the other night, Frick wanted to know why we were eating weeds. This is a salad I made with some of the weeds. Whisk together or shake in a jar. This is my dad. He passed away when I was 13 years old. That's not enough years for a girl to spend getting to know her dad. Like I never knew he was a cook in the army. These photos came up after my grandparents passed. 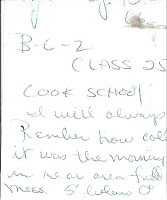 Here was his picture with his handwriting on the back. 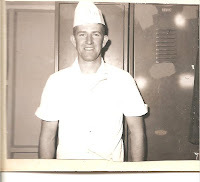 I always thought that my time in the kitchen was influenced by my mom, but now this makes me have this small connection with my dad. There's so much I never learned about him, but there are so many small connections he still makes in my life. It's been a lot of hard work, but the results are stunning. It would be even more stunning, if this was my yard. These are the gardens at Monticello, Thomas Jefferson's home in Charlottesville, Virginia. The man was avid about his gardens (although I'm not sure how much he actually dug in the dirt.) Did you know that his favorite vegetable was the pea so he planted twenty-three different varieties? The gardens were not the focus of our field trip, but that didn't stop me from sneaking off to snap a few pictures. Don't even get me started on the flowers! By far, this is one of my favorite field trip destinations. If you ever get the opportunity to visit, pay extra for the grounds tour in addition to the house tour. As an education group, we always get the four hour tour, and we still don't see it all. By the way, here is the actual garden in the yard. It is full of potential and only one variety of peas. Butterfly bush, green onions, strawberries, rosemary, Green Zebra tomato plants...aaahhhh. Frick has quite the taste. She picked out a loaf of bread from The Crazy Baker - Rhubarb Walnut Bread. I have established that I am not a fan of rhubarb, but this bread made me change my mind. Unfortunately, Frick did not like her selection which meant there was more for me. The Crazy Baker is one of those transfers into West Virginia who decided to stay. His brownies are addictive. This bread was addictive. I'm already thinking about the loaf I will buy this Saturday.